Cold Wave Over the Lowlands - Hi, friend Climate and Weather Information, in this article entitled Cold Wave Over the Lowlands, we have prepared this article well and concise to be easy to understand for you to read and can be taken inside information. hopefully the contents of the post that we write this you can understand and useful. okay, happy reading. 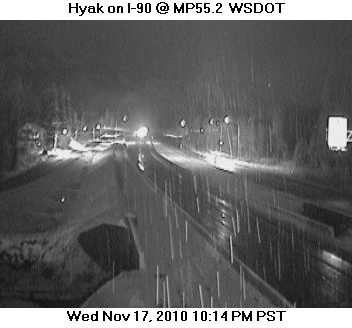 Other than a good snowfall in the mountains and I90 eastbound being temporarily closed due to spun out cars--things are quieting down right now--for a while. It is now become clear--with consistency among model runs and between models--that we will be entering a cold period starting late this weekend, with Monday and Tuesday bringing the coldest air since early December 2009. And it is sure that there will be strong northeasterly flow flowing through the Fraser River Valley, across Bellingham, and out across the San Juans and that this flow will strike the N. Olympics peninsula with a vengeance. The big Kahuna goes first..the cold wave. Arctic air will first start leaking into the area on Friday through the Fraser and other gaps and then push southward over the region late Sunday. Here are a few images of the model output for Friday afternoon and Saturday am showing near surface winds, and the surging air from the interior of BC. They are going to be strong! Heading over the northern San Juans, into Vancouver Is and then southward towards the Strait. Initially (Friday and Saturday), the cold air will be mainly over the gap-wind areas. Here are pressures, winds, and temperatures at low levels at 7 PM Friday. Blue colors are roughly cold enough for snow. You will also notice a substantial low pressure center over the SW part of the state. Saturday afternoon...still too warm for snow over most of the western lowlands. But on Sunday the low goes south and the cold air follows. We are then at the temperature transition point and there will be some light precipitation left. Yes, a chance of snow showers in the lowlands on Sunday, but nothing major and lots of uncertainty. And Monday afternoon, cool air has made it over us. But there will be little precipitation and thus little snow. Monday and Tuesday might see highs limited to the 30s! and Monday and Tuesday morning temps could easily fall into the 20s...and even the teens in outlying cold locations. Good time to remove hoses from faucets so they won't freeze up and other protective actions. Protect vulnerable plants. But I don't expect really damaging temps--and keep in mind this is early so the soils are relatively warm. What about lowland snow? On Saturday it will be limited to NW WA and the Fraser outflow region, so Bellingham, San Juans, Vancouver Island, and the north Olympic peninsula. You will undoubtedly find some TV station remote crews there. Here are the 24-h forecast amounts ending 4 PM Saturday. Also some snow in the mountains. Sunday we have a battle going on...the cold air is moving in, but the moisture is moving out. And you need both for snow. Here is what the model thinks for the 24-h ending 4 AM on Monday. Seattle and snow lowland locations do get some...but folks, I would not bet on any of this. The next series of runs will undoubtedly have the snow in a different pattern. And after that we go dry and cold. Sorry. So be prepared for some light snow on Sunday, as I am sure the Seattle DOT and WSDOT will be. The model runs on Saturday will be a far more dependable guide than what we have four days out. If you want to read more about what it takes to get snow around here and read about some of the great NW snowstorms, check out Chapter 4 of my book. Thank You and Good article Cold Wave Over the Lowlands this time, hopefully can benefit for you all. see you in other article postings.